Text in the "old orthography"
Made from earlier postmarks of the German "Ob. Ost" administration. Exception: DAUGAWPILS B and RESEKNE B with only one star to the left. 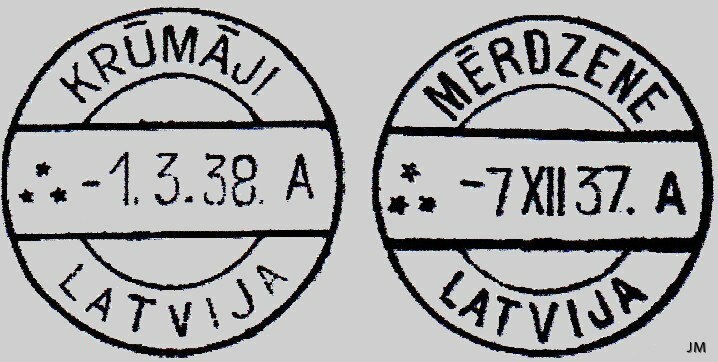 Text on the "new orthography"
From the end of 1935 / beginning of 1936 appears engraved postmarks altered with accentuation marks as "Ā", "Č", "Ē", "Ņ", "Š", "Ū" and "Ž"
Re-engraved type 2 postmarks to meet the rules of the "new orthography" – always with "LATVIJA" instead of "LATWIJA". Re-engraved type 3 & 4 postmarks to meet the rules of the "new orthography" like for type 7 postmarks. One exception – Priekule with an index letter "D" instead of "LATVIA"
Mostly are the segment bars removed from the type 6 postmarks but also new produced postmarks exist. The segment bars where engraved late in the 1930ies and in 1940. The new produced are also from late 1930ies.